Our reply Comments are supported by an affidavit by Fiber Broadband Association member: Steve Sellenriek, President of Sellenriek Construction Incorporated describing how important overlashing is to the rapid deployment of fiber infrastructure, cutting deployment time by 1/3. FBA files comments at the FCC supporting expedited fiber deployment in overlash situation. 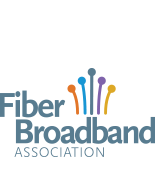 The Fiber Broadband Association filed comments at the FCC on Wednesday supporting expedited fiber deployment in overlash situations. The FCC today acted to remove barriers to wireless infrastructure deployment by determining that replacement utility poles that have no potential effect on historic properties do not need to complete historic preservation review.